I've started reading JP Gee's book, What Video Games Have to Teach Us; and, while playing with some WoW screenshots, I began thinking about virtual identities, which Gee talks about in Chapter 3. The combination of reflecting on WoW pics and Gee prompted me to write and post this blog entry yesterday: http://educatinglotus.wordpress.com/. I'd sure like to hear about your relationship to virtual identities and how you may be helping students adopt and maintain academic virtual identities. I never thought I really cared about my digital identity (as far as avatars, in non-online games go anyway). Last week, while I was deciding what to play after I finished LA Noire, I popped in Oblivion (Elder Scrolls 4) into my xbox that I had borrowed from a friend. I think I spent 30 minutes getting just the physical attributes of my character down (nose, hairstyle, hair color, race, skin color, mouth, eyes and so on). I thought that I didn't care, but my actions obviously say otherwise. "I created an interactive learning experience designed to provide students and teachers with opportunities to focus on digital citizenship while engaging in constructive play. I hope many will enjoy using it, contributing to it and interacting with it." As interesting as the game itself are the two online tools she used to make it. ThingLink & Mentor Mob I have not used them but they look like they hold some promise for creating interactive experiences fairly easily. "I would like to propose a fourth identity: Interrelated Virtual identities ( e.g., I the educator as Lotoa and Lotus) in which the gamer has two or more digital personae who interact socially with other gamers – in my case where other gamers know the virtual me as both a WoW toon and a Second Life avatar. Related to this are gamers’ relationships with their “alts,” alternate avatars or toons within the same virtual realm or world. But, really, this additional complexity is outside of Gee’s mission (at least so far in the book)." Besides the blog post, I would think that there's further research potential in your 4th identity category. I would love to see more writing from you regarding this 4th identity, and how distinguishing this identity in pedagogy affects the way students understand the purpose/meaning behind various avatar versions of themselves. Nice, nice work here Lotus, very interesting! I don't know if I can add much to your questions, but I'm going to give it a shot! I have struggled really hard to get some understanding of this. I don't have a strong feeling that a virtual identity means much. It seems like it's just a small bit of coding you have to do in order to go places on the internet. For places like Facebook, or this MOOC, it's just a matter of completing a fillable form. Hard to imagine that mattering much! But I suspect strongly that if any of my various identities were hacked, a great deal would be revealed to me. They are all created out of pure necessity, and I give them no further thought at all. But in the web of relationships that is the intractable life blood of the World Wide Web, I think my various virtual identities have a very strong relationship to who I am, or put another way, what my presence means to others (my definition of "identity"). A disastrous event such as a hack would be an extraordinary education, one I hope to never go through. Sometimes I just don't get why people are so hung up on virtual identity. But that's because I come at "identity" from a theoretical standpoint (I teach a graduate seminar in cultural studies, in which we examine the state of "identity" and identity politics in the context of globalization and the so-called "information age"). I might have intellectualized identity away! And I will always argue that an identity is not necessary. Nor must it be fixed. These are political matters. People are very emphatic about identity, and just because I don't always "get" it certainly doesn't mean it isn't real, or very, very important. This fall, GamesMOOCers will have an opportunity to go on a dazzling field trip to the Smithsonian in Second Life to enjoy Chicano art, poetry, music, and culture. The curator told us last fall that artists and poets who enter Second Life for the first time are completely and utterly captured by the creative possibilities inherent in virtual identity. That's something very, very exciting, and I am really looking forward to learning more. This is something I've never thought about doing. I really try to keep my students inside the LMS for the duration of the course. I want the LMS to continue to expand. It has begun to include library resources, but the day it includes opportunities for virtual experiences will be a marvelous day indeed! So I suppose the question is, what is an "academic virtual identity," and what purpose does it serve for students? You bring up some interesting points! I think that identity has been a BIG thing recently, with the hole "personal brand" BS that's been out and about on the web and (supposedly) popular with my generation ("net gen"). When I hear about "personal brand" I want to barf because it all sounds so conceited. That's why I don't speak too much about identity creation, because conscious identity creation may just be a log of bull, and not really who you are. That being said, I've reflected a bit on my own virtual identities. 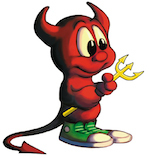 When I was frequenting online fora, I had a BSD Daemon as my avatar (still love that little guy!) and my tag (see where Shivtr has me as an "initiate?") would be "Daemonic Member. A Daemon being a background process that facilitates the running of a computer - in other works being active on the boards and helpful to others - and my post-count showed this off. I think that actions (my contributions) speak much louder than any self-described identity that I would tell someone about myself. Little things like the avatar, your signature and your tagline serve as a way to add to that identity, but I don't think that they define it. What a wonderful discussion and blog post Lotus. Thank you for your reflections and images. James Gee's background in linguistics makes me wonder about the connection of dialogue and identity/avatar/self, specifically for the cultural benefit of potential collaboration in digital spaces. Dr. Amy Baylor (Florida State University) and Dr. Jeremy Bailenson (Stanford) have been studying the impact of changing avatar dynamics for how our real-life behavior reacts. Gee's initial characterization (pardon the pun) as "gamer" identities suggest many other types of identities beyond gaming. Scholars researching the differences in digital avatars and game characters inform us about our own humanness. The power of pretend is now much more scientifically and artistically enabled as we make little choices. The concept of the "self" and how we cultivate self using gaming and immersive virtual experiences is really interesting. I hope others can share their insights as you have too. "I think that identity has been a BIG thing recently, with the hole "personal brand" BS that's been out and about on the web and (supposedly) popular with my generation ("net gen"). When I hear about "personal brand" I want to barf because it all sounds so conceited. That's why I don't speak too much about identity creation, because conscious identity creation may just be a log of bull, and not really who you are." This is interesting because I have been advising my online orientations (done in-person, of course): "How you write in your course is how you are perceived. Write sloppy and everything you do in the course will be seen as probably sloppy." Most of their interactions will be via writing and reading, in most online courses. It's my way of trying to get them to understand how to project themselves well online. I suppose that should go further, though, and I think it ties into this idea of virtual identities. Taken one step further...how does the image we choose for our avatar on a discussion board affect how others see us? What about if we put a quote in our signature? And then a step further than that: How does the way we adjust our virtual avatar in Second Life or Open Sim make others perceive us differently? While I agree that the "net gen personal brand" stuff smacks of hubris, there's something there. How we're perceived tends to be how we act. How we act influences others. Anyway, these are the ramblings of a pretty darn tired Multimedia (Computer Graphics) instructor. What do you think? How much of an impact would having students develop a professional persona online and in-world have on their learning? Thanks to all of you for a stimulating discussion. As I read this discussion I began to think about the simulacra thread. Is personal brand the simulacra of reputation? So I googled simulara, repuation, and brand and found this intriguing book, at least by its title. What struck me was the two dimensions he talks about, profiles in the datascape, and personas in social networks and interactions. "The assimilation of humans into machines, once science fiction, is a reality today. Each of us has virtual versions inside the two great machines of the late modern age. In the datascape, the vast array of databases in which the details of our daily lives are recorded and analyzed, we appear as profiles. In cyberspace, the global network of computers in which everyone can connect with everyone, we appear as personas." There are some chapters avail on the site if you want to give it a scan. I've been out of pocket with the opening of school this past Monday. However, I am trying to catch up a little. This discussion interested me because of what I saw in my students this past week (9th Grade). One of their assignments was to create an avatar to represent them in the game. They could draw one or print one from an image on the net, but they had to name it and decide on a profession. It was interesting to see the variety of characters each student picked, from Bugs Bunny and Sponge Bob to warriors from their favorite games. What I found most interesting, however, was the names. They picked some of the simplest names, i.e., Fred, Mary, etc., or used the actual name of the character. As for the professions, they all wanted to be the leader or the warrior, but I suggested that each guild/spaceship needed a variety of professions. It's going to be interesting to see how this plays out. Thank you so much for finding this book! I have been doing a little research on the various ways that people are talking about and writing about the "post-human," and this one looks interesting enough to warrant the time, even if I heartily disagree with the conflation of networks with "machines"! Anyone who has worked on the practical matters of networking knows that machines and the cables which connect them are really, really different than the application/software-level processes and UI's that ride on them! Hey, I remember UNIX! I love your cartoon "daemon." It captures the personality of these faithful little processes quite well! On a slightly more serious note, I think "personal brand" might be connected with the prevalence of freelance writers and hopeful thinkers on the internet. Their "brand" is how they find clients, and hopefully paychecks. Even though I freelance (writing, not thinking), I haven't ever worried about a "personal brand," but that's only because I'm not hard up for work. If I were, I'd be out there creating an appealing persona for all I am worth!